The first time I started seriously thinking about financial independence was when I stumbled across Mr. Money Mustache’s blog and just about read every post back to back. Of course I’d thought about retiring early and becoming independently wealthy before then, but my ideas usually stemmed from the idea of building a business to earn hundreds of thousands per year so that I could put enough money in the bank to retire on. The thought of investing had only briefly crossed my mind. After picking up an Investing for Dummies book, I quickly tossed the thought aside. The process seemed so complicated and uncertain, and I figured I would probably just lose all my money in the stock market anyway. If you’ve ever felt this way too, welcome to the club! As I read more and more about financial independence, it was made clear to me that investing well is not complicated. In fact, it’s terribly simple. It just takes time and dedication to see it through. 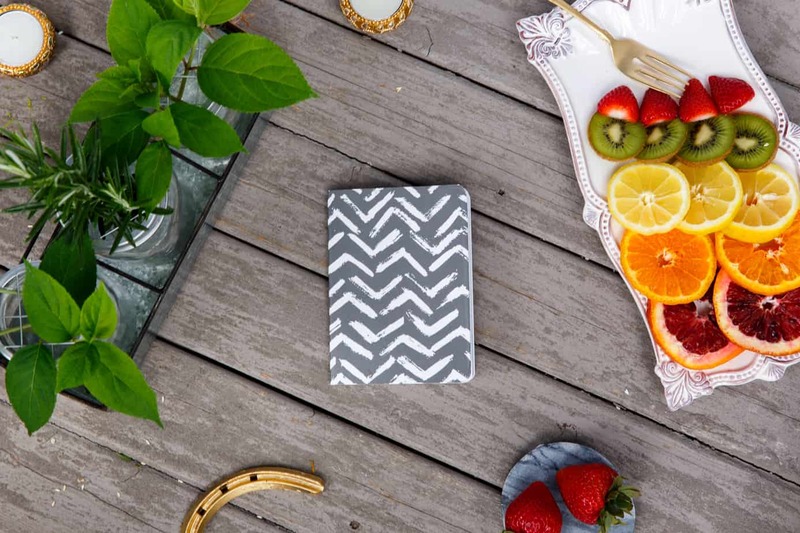 MMM’s blog laid out a simple plan for cutting your expenses, investing your extra money, and understanding how much you will need to retire. As it turns out, you don’t need as much as you think you do. We’ll get to that in a moment. 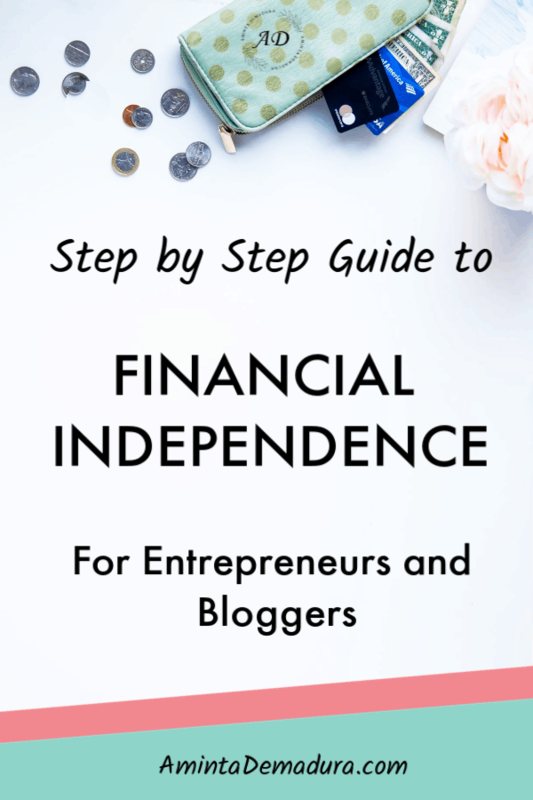 ​You may be wondering why I’m bringing up financial independence on a blog primarily written for entrepreneurs. Oh boy, let me tell you! My biggest goal and intention with this blog is to change people’s lives. I see the way we’re living today, and it drives me crazy. The long hours of work and huge commutes, the little time off to spend with family and going on adventures, the waste, the debt, the confines of our societal structure. The list goes on and on. I don’t believe in these things. In my perfect world, no one is stuck in a job they hate. No father wishes he could come home and spend more time with his babies. Nobody sits in 2+ hours of traffic per day just to start their day at work. Nobody feels like life is passing them by. Nobody thinks that if they only had a little more time, they could fulfill their dreams. Nobody passes up their life’s work to be replaced by a job that they perceive as more stable. No one is unable to retire due to lack of money. No one wishes that they could just go back and start over, because their life looks nothing like they thought it would. In my perfect world, people are free. They love their work, they make plenty of money to live comfortably, and they are free to choose what projects they work on and when. Their families and communities thrive. We reduce the dependence on waste of time and materials and use our resources to better the rest of the world. Financial independence fits perfectly into this idyllic world of mine. It is the ultimate freedom. When you are financially independent, you don’t have to stop working if you don’t want to. In fact, you just don’t have to do anything anymore. That is the beauty of freedom. ​In my opinion, entrepreneurship is the perfect catalyst for FI. Sure, you can definitely put a regular job to work for you and retire early. As an entrepreneur, however, you have complete control over your income. Whereas in a job you may not always get the promotion you worked for, and your salary is likely capped at some point, with your own business you can create as much cash flow as you want and are willing to work for. And of course, more income equals more independent years of your life. ​This is simple. Take an hour or so and figure out exactly how much you spend in a given year. Don’t worry about your income yet. Just look at what your monthly and yearly expenses come to. As you can see, that’s not nearly the millions upon millions we’ve been told we need to retire. Which is great! One thing Mr Money Mustache recommended that I love is that you can include a paid for home in these calculations. $3,000 per month in dividend income looks a lot rosier when you don’t have to pay for housing, doesn’t it? What does your retirement income look like if your home is paid for? While it may seem like an impossible feat to save up a half million or million dollars, don’t forget that compound interest will be at work for you. Check out this quick graph for an idea of how much money compound interest will give you, for free! This chart assumes a conservative 7% rate of return. Isn’t this chart awesome? You guys, you can retire with a MILLION dollars in 10.5 years according to these numbers. Isn’t that nuts? Look closely at the interest section. If you remember compound interest from high school, you’ll see that compound interest starts off slowly at first but quickly gains traction. Compound interest is not linear. The growth is exponential! In the first few years your compound interest may only grow by a couple of thousand dollars, but around year 7 in this model you will see that the interest grows by around ten thousand dollars per year. That’s a lot of free money! And that free money is reinvested into your account to earn another 7%, which will in turn be compounded again and again and again. Fascinating. Of course, these numbers are all hypothetical. Everyone’s income is different, and everyone’s expenses are different. The key here is to realize that if you’re working smart, your income, and thus the amount you can invest, will go up each year. If you are smart about keeping your expenses to a minimum, you will find that each year you can put more money towards FI, and those amounts will grow huge dividends as you along. Pretty cool, right? ​​When it comes time to begin drawing on your investments, you'll probably follow the Standard Withdrawal Rate, which is 4%. This rate is adjusted for inflation, meaning that it leaves enough money behind to adjust for the ever increasing cost of living per year. This rate is recommended by the researchers of the Trinity Study, one of the most influential papers in the finance industry. So when your investments earn an average of 7% over the many years it is invested, and you leave 3% to account for inflation, you are left with a safe withdrawal rate of 4% per year. This leaves your principal amount relatively untouched, while you draw only on the dividends earned from your principle nest egg. So if you follow my chart and have invested $750,000 in 9 years, you will then be able to withdraw $30,000 per year, or $2,500 per month, almost indefinitely. With a paid for home, that is definitely a comfortable amount to live on each month. And if you decide to wait it out another year and a half, you can pull $40k and increase your monthly income to $3,333. ​Now that you can see the power of investing your money for a financially independent future, it’s time to make sure that your debt is gone. If you have student loans, auto loans, or credit card debt, now is the time to kill them off as quickly as possible! As you saw from the chart above, investing is most successful when you give it time to grow. The first few years likely won’t show a lot of growth, but give it 10 or even 20 years and the growth will be out of control. Have I mentioned that those thousands and thousands of dividend dollars are essentially free money that makes more free money? When it comes to your house, the best way to decide whether you should pay it off first is to look at your mortgage rate. Assuming that your investments will earn about 7% per year over the long haul, you can compare that to your mortgage rate and determine the best plan of action. If your mortgage’s interest rate is below 7%, start investing and pay off your home according to your 15 or 30 year loan. If, God forbid, your mortgage rate is 7% or higher, pay that sucker off first because that compound interest is working against you. ​Before you start investing, it is a wise idea to set up an emergency fund of straight cash in the bank that can be used for unexpected large expenses. I recommend between $5k-$15k depending on your household. Are you single? Do you have a mortgage? How stable is your work? Are there two of you working? All of these things should be considered when you decide how much of an emergency fund you should have. Generally if you have two working people in stable jobs and no children, you’ll probably need a low emergency fund. If you have a mortgage and a couple of kids in a single income family, especially if the breadwinner works on commission, I’d err on the side of caution and go for a bigger emergency fund. There are two rules to investing that I like to follow. 2. Once you put your money in, do not touch it for any reason other than to pull once you have reached your FI number. Index funds are wonderful for a number of reasons. If you go through Vanguard (and I highly recommend you do! ), the fees are miniscule. Vanguard is essentially a co-op that is owned by its shareholders. 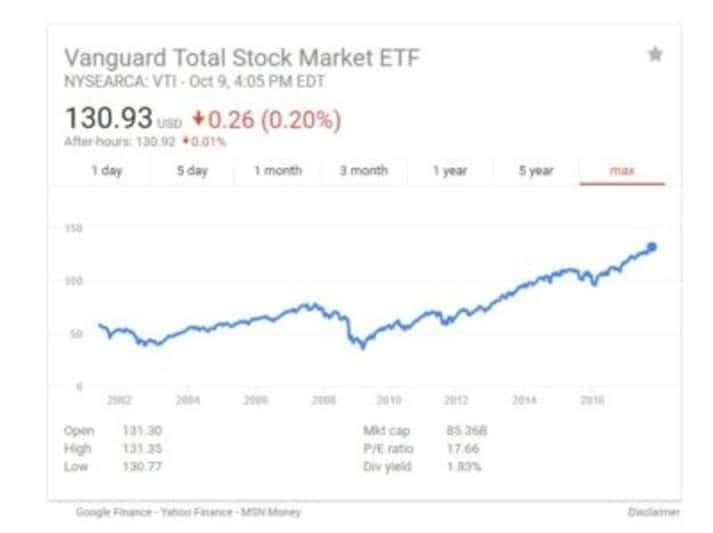 Unlike virtually all of the other investment companies, Vanguard does not have an administration or management group at the top that siphons money off the backs of its shareholders. This means more money in your pocket and a very low chance of shady backdoor deals being made with your investment money. Index funds are also great because over the long term, returns always go up. Of course year to year there will be dips and gains, and occasionally some massive drops, but over an 80 year stock market cycle the market has historically always seen a gain. This is great, if you are able to be strategic as to when you begin pulling your money and have the mental fortitude to not touch your investments once you’ve placed them, especially in a down market. I have two favorite index funds that we use for most of our investments. The first is the S&P 500, which is an index that contains stocks from the top 500 publicly traded American companies. The second is VTSMX, the Vanguard Total Stock Market Index Fund. The VTSMX is a grouping of all of the companies that are publicly traded in the stock market. ​There are two keys to investing enough money to reach financial independence within a ten year time frame. The first is to reach a high savings rate. Currently the average American savings rate seems to bounce between 4-6%. Most experts on FI will recommend that your savings rate reach at least 35%. A 50% savings rate is considered ideal, and many people strive for as much as a 90% SR. Certainly it is easier to have a higher SR with a higher income. Someone making $100k per year will have an easier time reaching 50% than someone making $24k will. But a lot of your SR has to do with how you live, aka your expenses. Multiple cars, too much house, unplanned grocery habits, and eating out are easy things to cut that will make a huge difference in how much you can save. After you’ve cut everything from your budget that you reasonably can, the second key to putting away enough money is to simply earn more. The good news is that for the average person, income tends to go up each year naturally. As your career progresses or your business ages, increased revenue can be expected. So while your first year of investing may seem sparse, increasing your investment amount each year is very reasonable if you can hustle. ​Why Do You Want To Achieve Financial Independence? ​In any big adventure, the first thing to do is start with your why. Why do you want to set out on this journey? Why do you care? Your why is the most important first step towards vision, and it is just about impossible to succeed without a vision. When you have it, your path is clear. To wrap up today’s post, let’s chat about your FI goals. Why do you want to achieve financial independence, and what do you think is the biggest obstacle you will face in doing so? 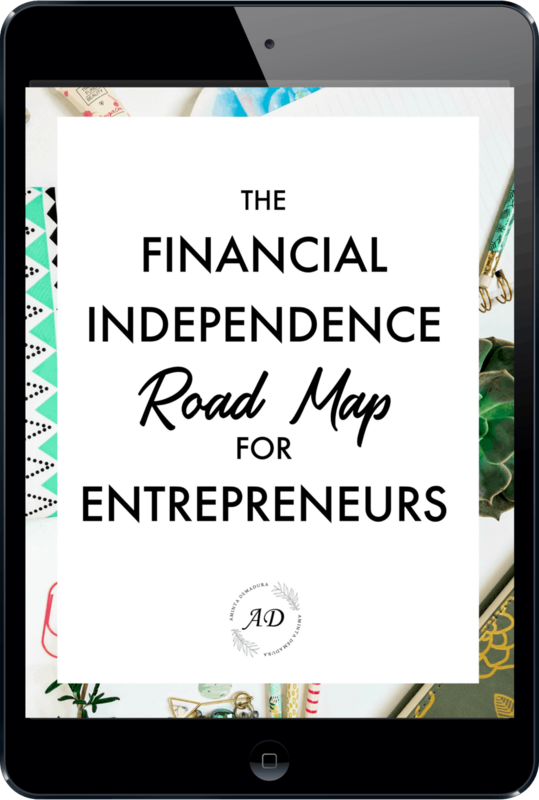 The Financial Independence Road Map will show you how to get out of debt, increase your savings, and invest the smart way so you can become truly financially independent. Join the FIRE Hotlist and receive the road map as a perk of becoming a subscriber.